Awatovi Black-on-yellow bowl. Click the image to open the Awatovi Black-on-yellow gallery. 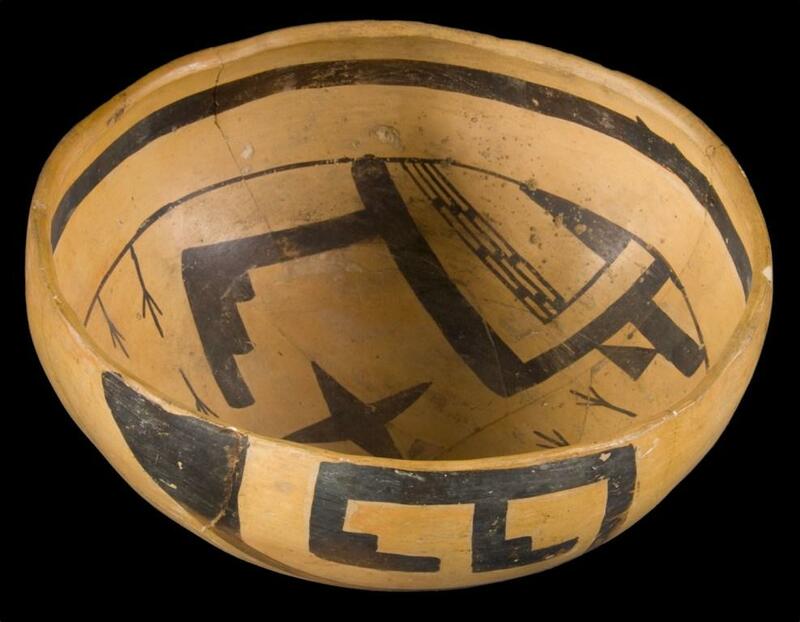 Awatovi Black-on-yellow was produced in the Hopi villages (especially at Awatovi on Antelope Mesa), and like other Jeddito Yellow Ware types, traded throughout north, central, and east-central Arizona. Firing: In an oxidizing atmosphere. 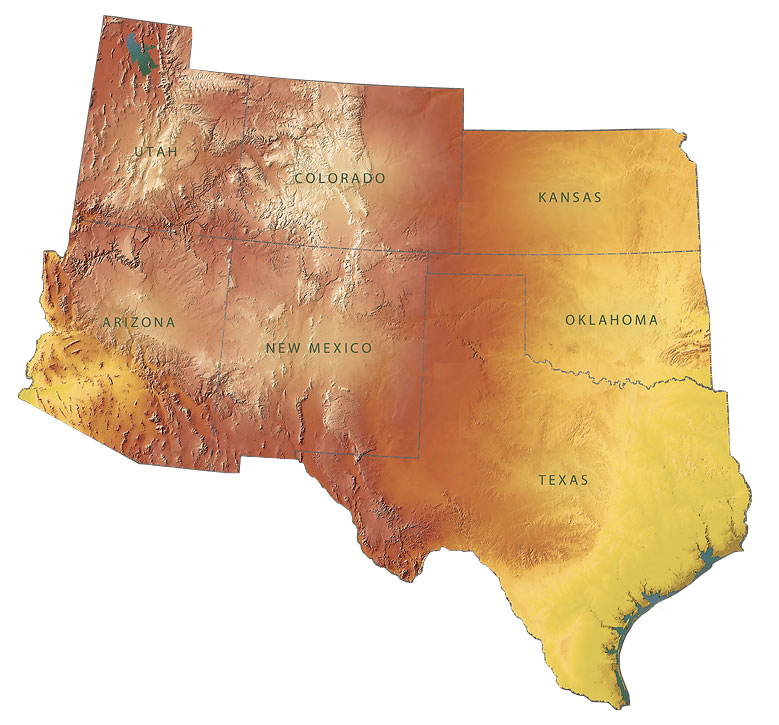 Core Color: Generally yellow; can be light red, reddish-brown, and pink. Temper: Fine quartz sand and sherd rarely visible to naked eye; occasional reddish angular fragments; temper rarely visible without a hand lens either in cross-section or on vessel surfaces. Surface Finish: Exterior of jars and interiors/exteriors of bowls well smoothed and polished; no slip or wash; jar exteriors have barely visible horizontal wiping striations; jar neck interiors smoothed. Yellow to light red, reddish-brown, and pink; surface and core colors do not differ except in misfired specimens. Forms: Bowls, jars, ladles. Bowls and ladles are more common than jars. Vessel Thickness: 3.7 to 10 mm, average 6.1 mm (bowls); 4.3 to 9 mm, average 6.5 mm (jars). Paint: Dense black to reddish and brownish hues; “blush” or bleeding of the paint is common. Design: Geometric; large amount of black relative to yellow; banding lines, often below the rim on bowls, with a line break; layouts are zonal, radial, meridinoal, and overall (strictly zonal on jars); elongated solid triangles; interlocking attached scrolls; circumferential bands; continuous angular frets; isolated figures. Comparison: Distinguished from Jeddito Black-on-yellow and Sikyatki Polychrome by paste and surface characteristics. Awatovi Black-on-yellow has more diverse temper in a more restricted size range, and in greater amounts than Jeddito Black-on-yellow, which is usually tempered exclusively with sand. Awatovi Black-on-yellow paste is more reddish-yellow; Jeddito Black-on-yellow can be almost white. Other Names: Polished decorated ware, Yellow Ware, Buff Ware, Jeddito Yellow, Jeddito Yellow Ware, Jeddito Brown-on-yellow. Shofer, Jeanne Stevens. (2005) Jeddito Yellow Ware – Type: Awatovi Black-on-yellow, Ceramic Field Identification Manual: Agua Fria National Monument Project. Museum of Northern Arizona, Flagstaff. Meghann M. Vance, Northern Arizona University Anthropology Laboratories.